Sub Epic Mis-Adventures: Did I just see Anderson Silva (try) do the Steven Seagal parry? Did I just see Anderson Silva (try) do the Steven Seagal parry? 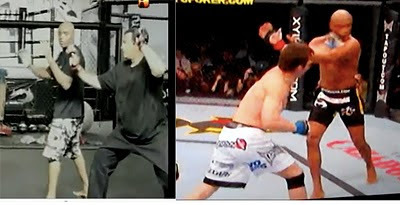 So during the fight Sonnen (white trunks) threw a quick straight left while closing the gap towards Silva (black trunks). The punch slipped through anderson's hands... but normally he does a bob/weave/duck to counter straight rear hands.... he does it a few times early in the match... ducking straight punches and weaving off..... The interesting thing is... this looks unusually familiar to the move steven seagal was teaching him in the video below.... i think its a rear hand parry into chop.... I think the fight talk guys may have been right about Anderson trying something crazy (he also landed a perfect spinning back kick to sonnen's gut... (sonnen said he got kicked really hard and it hurt and that he had never been kicked like that before) .... anyhow even if it's ann accident the two pictures side by side are funny.